Have you ever noticed that you are much more aware of things when they become important in your world? If you are in the market for new glasses, you suddenly realize and take notice of everyone else’s glasses. Say you are pregnant; suddenly it seems like everyone around you is also pregnant. Painting at your house? You are all of a sudden very aware of all the different paint selections around you. The same is true for our Curtain-Tracks staff. Everywhere we go, we notice the curtains and the hardware. According to www.brainfacts.org, there are many studies happening about the science behind this attention. We love what we do so much that it becomes part of who we are, even on vacation. Sometimes we notice the curtains because they need some attention and we know our products could do a better job. Other times, like when Curtain-Tracks’ friend Bob looked up, he noticed what an awesome job our products were doing. 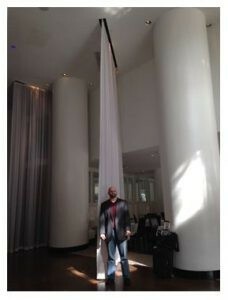 He sent us this picture from a hotel in New Orleans. It shows how huge (and therefore very heavy) these curtain panels are, and Bob noticed that they were very securely hung using heavy duty curtain tracks and hardware. It’s not entirely surprising it was a heavy duty track that was noticed. We have written several posts about the many different uses of our heavy duty curtain tracks line. From a church to the garage and everywhere in between, this line can hold the heaviest of curtains and stand up to the most frequent openings and closings. These heavy duty curtain tracks are often combined with heavy duty curtains. Many theaters use our products to support their super heavy stage curtains because they can handle the weight and the frequent use and some hotels use them to divide the space in a room into kid and adult space. The possibilities are really only limited by one’s imagination. We are willing to bet that if you have been a loyal Curtain-Tracks Blog reader, you likely now exactly what we are talking about. You have probably drawn the curtains in your hotel and taken notice of how they are hung. Or, maybe grumbled under your breath at the hardware that got stuck as you tried to close the curtain or the light peering through too early in the morning. On the flip side, it's pretty exciting when you notice our products doing their job well. If this ever happens to you, take a picture and send it to us!